The Other Side and Never Give In are taken from powerful messages delivered during time of war, WWI and WWII respectively. The selected texts take the reader from the depths of despair to the height of determination. 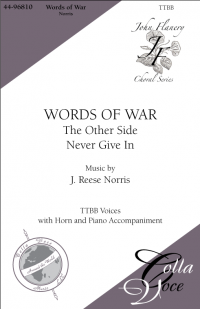 The horn was chosen to accompany the piano and choir because of its uncanny ability to, both- weep and call to arms.